In 1969, Philippe Mercier, an employee of Rapidase in France, authored an article (not available online), Trappist Beer Production in the Monastery. It was published in Wallerstein Laboratory Communications, a technical publication of Wallerstein Laboratories, an American consultancy. I previously gave some history on Wallerstein, a firm which serviced the fermentation and food technology sectors. See here. Two brothers started the business in about 1900 in New York. Some time in the 1950s or 60s they were acquired by another company. The house journal continued at least to 1969, clearly. The Mercier article, running some seven pages, is of significant historical value. It has never been previously cited in a consumer beer publication, to my knowledge. It is a valuable aid to understanding Trappist brewing before beer sage Michael Jackson’s The World Guide to Beer (1977), which first drew international attention to modern Trappist brewing. The article starts by sketching Trappist brewing history in a way not unworthy of Jackson himself. It next outlines brewing equipment and processes, maturation, and marketing (sample: “there has been no advertising and the beer is not widely known”). Fairly detailed analytical data is presented, some quite sophisticated, e.g., gas chromatographic data on bottle head space at different years’ aging. A number of tables report technical data for three breweries, identified as Brewery A, Brewery B, and Brewery C. It covers things like IBU (a bitterness measurement), and colour on the SRM and EBC scales. … thanks the directors of the breweries of R.P. Trappistes de Chimay, Rochefort and Westmalle for their help and for the data necessary for preparation of this paper. Photographs are included with a legend referring to the brewery, for example, the exterior of Westmalle is shown, and a goblet of its beer. There are a number of characteristic features in the brewing of Trappist beer. The grist is usually composed of about 95% amber malt representing an equal mixture of two varieties, both two-rowed, and the monasteries use whatever malt is available. In some cases they grow their own barley and malt it, but in most cases the monks rely on commercial maltsters. Typical malt analyses are shown in Table 1. A high nitrogen content is preferred as this is associated with high diastatic power. To obtain the characteristic dark hue desired, two varieties of amber malt are used, one considerably darker than the other, together with up to 5% caramel or roast malt. In some cases, a very small amount of glucose syrup may replace some of the caramel malt, usually not more than 1 or 2%. …. When glucose syrup is used it is customarily added at the wort boiling stage. This tells us the three breweries were essentially all-malt in 1969, with a grist of two forms of “amber malt”, up to 5% black malt or caramel malt, and up to 2% glucose. The glucose was probably used to adjust original gravity to the required level, as needed. About 20 years ago there occurred a lively discussion in beer circles on the purpose and origins of the “wheat flour” or “wheat starch” used in Chimay’s mashing system. This followed in the wake of Chimay’s labels being changed around 1997 to state that both “starch” and sugar were ingredients together with barley malt. 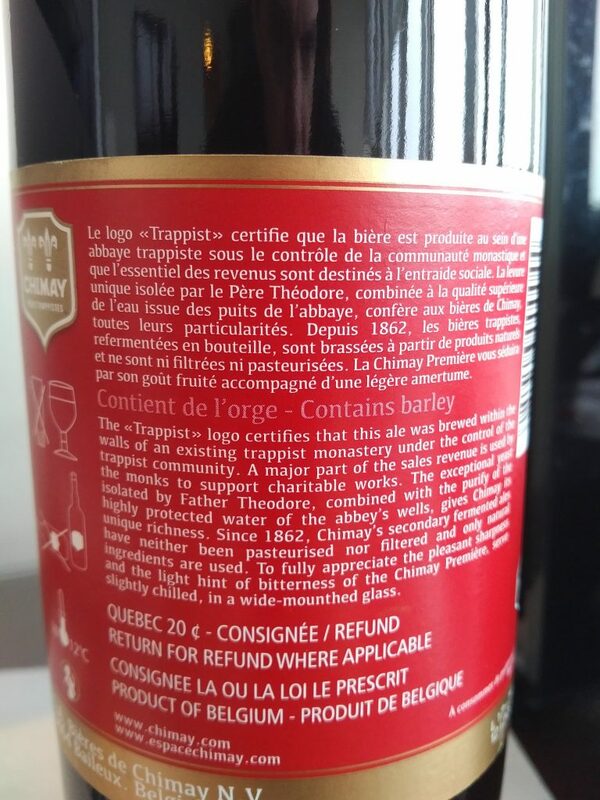 Today, Chimay’s labels refer to “barley” and perhaps also “wheat” but to my knowledge not starch except, one presumes, where a law may require it. The current website of Chimay refers to “ground barley” and other “ingredients”, not starch but a previous version of the website did refer to starch. So, in the late-1990s beer writers started asking questions about the starch. Many had assumed the beers were all-malt except for possible use of some sugar, a longstanding practice of many Belgian breweries. A good summary of the controversy and the brewery’s reaction are set out in a 2005 article by U.K. beer writer Roger Protz, “The Beers of Chimay, Plus Ça Change“, which you can read on his website here. Michael Jackson’s landmark 1977 book did not discuss the mash composition of Trappist beer although mash information was frequently discussed for other nations’ beers, especially where cereal adjunct (a barley malt substitute and generally cheaper to employ) was used. Wheat flour and wheat starch are both malt adjuncts. The first contains gluten (a protein), the second for practical brewing purposes does not, to my knowledge. Either way, with up to 2% glucose used in the boil stage, it appears that for about 20 years or more, but starting some time after Mercier’s article appeared in 1969, Chimay has used 15-20% non-malt in the Red and Blue labels. Protz’ article refers to another, contemporary article in a CAMRA magazine that suggested a process change had occurred at Chimay in 1969. I have not been able to find a copy. It seems the fathers were not pressed by CAMRA on what this change was. Perhaps the matter even then seemed too removed in time, or was assumed not to relate to mash composition. But given the Mercier article, I think it is plausible that wheat flour/wheat starch was first used at Chimay in 1969, 1970, or some time after that but before Michael Jackson’s World Guide to Beer in 1977. I’m wondering now if perhaps Jackson knew in 1977 that cereal adjunct was used but chose not to mention it. On the other hand, if Mercier’s description of the mash was still applicable in 1977, then the adoption of grain adjunct use had to occur later. Mercier himself does not mention any use, even occasional, of grain adjunct. To be sure he writes, “The grist is usually composed…” (my emphasis). Perhaps Chimay’s practice varied occasionally, or that of Westmalle or Rochefort, even before 1969 that is, to include cereal adjunct, but I think this unlikely. Mercier states in the article that he worked for Rapidase. Based on my further research, Rapidase in the 1960s was based in Seclin, France in the north. It manufactured industrial enzyme made from plant and other natural sources. The product line still exists, owned today by a different company. American-based Wallerstein had patented various enzyme products that Rapidase was commercializing in France and Belgium. European two-row barley sometimes then did not produce sufficient diastase to convert adjunct-derived starches to fermentable sugar; enter Wallerstein’s enzymes, among other products available in the market. It seems reasonable Mercier was marketing Rapidase – think “rapid-diastase” – to breweries for use with adjunct mashes. Probably Mercier became intrigued with Trappist brewing traditions in general and decided to memorialize their contemporary practice in this article. Whether any palate change, or a significant one, occurred in Chimay beer between 1969 and today, and for Westmalle or Rochefort, I can’t say. The situation is complicated by the fact that in the 1990s Chimay changed its fermentation equipment. Some observers, including Michael Jackson in his later pocket guides, speculated the yeast adapted differently in the new, cylindro-conical vessels and the taste became altered for that reason. Perhaps adjunct brewing was first used when the new fermenters were installed although I incline that its use started earlier. 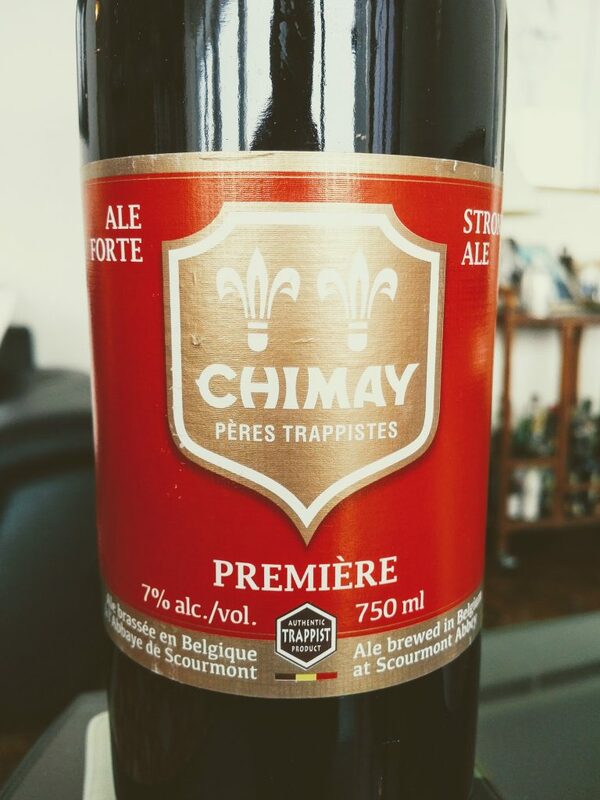 Certainly Chimay’s and the other Trappist beers remain legends in the brewing world. The beers are certainly distinctive in taste and in general, “Trappist” still denotes a style, a general approach to brewing shown by a similar yeast signature, bottle-conditioning, top-fermentation, and an emphasis on strong beers. No brewery stays the same in terms of process, and one should not consider the Trappists any different. Still, it is significant that in 1969, Chimay, Rochefort, and Westmalle were brewing from all-malt, or virtually so as 1-2% glucose could have no practical effect on the sensory result. It seems clear their recipes have not remained static with regard to mashing procedure, at any rate. A particularly striking feature of Trappist breweries is the curious mixture of the industrial and the religious. One is in an up-to-date brewery and at the same time in the serene and timeless atmosphere of the monastery. … One Trappist brewery has a conveyor belt for handling wooden cases, the modern apparatus contrasting sharply with a very old building where the original beams still support a slate roof. …. All the equipment reflects the wish to adopt any means of producing a beer with all the qualities indispensable in our modern age but at the same time maintaining its traditional organoleptic properties. N.B. See also my next blogpost, here, on the plausible use of orange peel in some of Chimay’s current range. I make further observations there that bring in Mercier’s article again. I look forward to seeing what you’re writing for Brewery History. I really must get round to writing something on cylindro-conical vessels myself, as I’ve reading up a lot on them recently. One thing about them is they can be much bigger and taller than traditional ale fermenters. This means the yeast is under more hydrostatic pressure, and fermentation is also sped up as the CO2 creates more circulation and helps keep the yeast in suspension. Both these things affect the production of flavour volatiles. Yes, for sure. I believe it had some effect when they changed it at Chimay. We had 5% abv Heineken both before and after the change. There must have been some palate difference, but I don’t recall anything pronounced. I don’t know if the attenuations perhaps changed in that case. For Chimay, the fermenter change is probably a big part of the reaction of some 15-20 years ago to a perceived palate change. But this other aspect (adjunct) many apply too especially as we know now that Chimay was all-malt, essentially, as recently as 1969. Nice article, particularly the bit on the taste/ F.V design change ! I think the Heineken grist make up probably altered around the same time as the UK got the full strength version @ 5% , as opposed to the 3.8% version ( UK brewed).